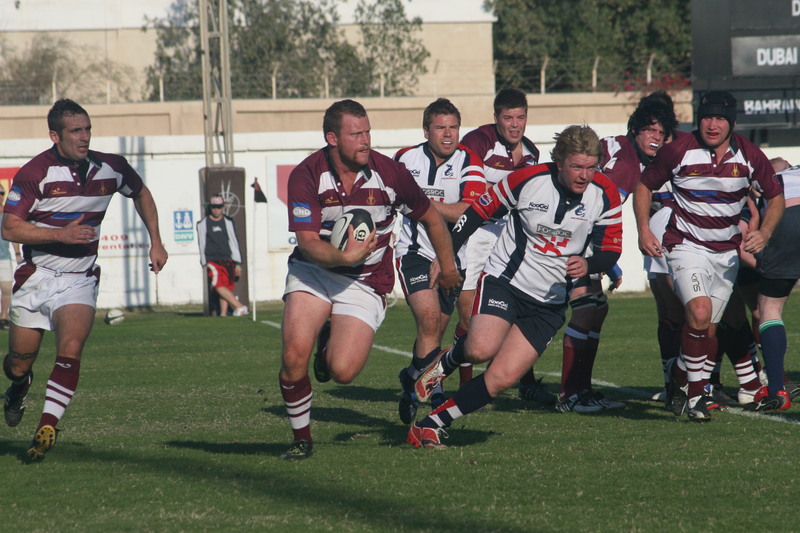 Winston Cowie playing rugby for Doha, 2011. Martyn Thomas of Sport360 reports on this weekend’s West Asian Club Championship Rugby final here. Abu Dhabi Harlequins assistant coach Winston Cowie has some unfinished business to attend to in this weekend’s ARFU West Asia Champion Club (WACC) final. The 31-year-old saw his playing days ended by a horrific injury in the 2011 showpiece – the former Doha No8 dislocating his knee and tearing ligaments with the final just 10 minutes old. Doha went on to lose 24-20 to Dubai Hurricanes and by the time they lifted the trophy 12 months later, Cowie was back home in New Zealand. However, his decision to return to the Gulf with his family last summer, this time to Abu Dhabi, has given him a shot at “closing a circle”. Cowie joined Jeremy Manning’s coaching staff at Quins at the beginning of the season, and has helped guide the capital club to 10 wins out of 10 in the Gulf Top Six as well as a home WACC final against Jebel Ali Dragons on Friday. “It would be a massive deal,” Cowie said of the prospect of claiming silverware this weekend. Given his affiliation with Doha, where he spent three years and captained the first team, Cowie admits he was a little apprehensive about joining one of their main rivals. Indeed, since the turn of the year Quins have been unstoppable and they head into Friday’s game at Zayed Sports City as favourites having dropped just four points of 50 available in an unbeaten campaign. Cowie added: “They’ve been consistent and that’s against very, very good opposition. Being around the Gulf for a number of years I haven’t seen this level of footy across all six teams in the competition. The New Zealand historical fiction novel Greenstone Trail by New Zealand author Winston Cowie, is now available as an ebook on Amazon Kindle and Apple Ibooks. To purchase Greenstone Trail on Amazon Kindle, click here. To download the Ibooks app for free, click here. And to purchase Greenstone Trail by Winston Cowie from ibooks, simply type in ‘Greenstone Trail’ and you will be on your way to learning about the fascinating and largely unknown New Zealand Land Wars of the 1860s, written in an interesting historical fiction style. To booklovers in New Zealand, you can purchase one of the few original hard copies of ‘A Flame Flickers in the Darkness,’ from which the ‘Greenstone Trail’ and ‘Flames Flicker’ ebooks are based, via Fishpond, by clicking here. A note, you have to be in New Zealand to order a hard copy. Flames Flicker, the second ebook in this series, which spans the Invasion of Waikato, the Chatham Islands, East Cape, mystical Ureweras, and Second Taranaki War, will be released as an ebook in 2014. And some spine-tingling reviews coming in from some of the descendants of those involved in the wars.